Hours before Apple is expected to unveil its third-generation iPad, an alleged leaked photo appeared online attempting to confirm the inclusion of an ultra-high-resolution Retina Display on the device, but it was later debunked as fake [updated]. Razorian Fly published the image early Wednesday, noting that an anonymous source had left it in the publication's "tip box" overnight. The tipster reportedly claimed that it showed a Retina Display-equipped iPad. Update: But hours later, the site updated its original story to declare the image fake. It was sent to a number of websites overnight in an attempt to garner attention. 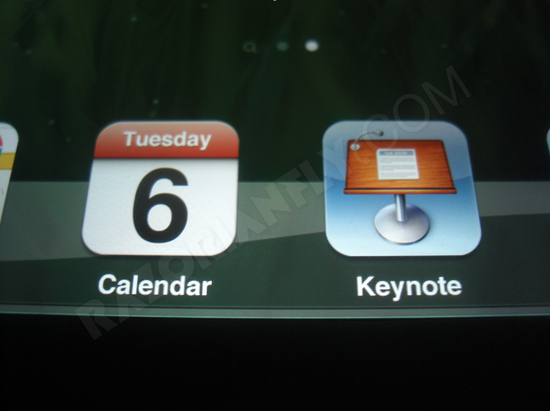 AppleInsider was unable to confirm the authenticity of the image, and has included it here for the sake of discussion. A bevy of reports have suggested that Apple will double the linear resolution of the iPad to 2,048 x 1,536 pixels, giving it a pixel density of 264 pixels per inch. Most recently, server logs have suggested that devices with that resolution have been accessing popular technology websites while also coinciding with visits from possible prototype iPads on Apple's Cupertino, Calif., corporate campus. The iPads appeared to be running iOS 6 with an newer build of WebKit. It is unclear at this point whether Apple would elect to use the "Retina Display" marketing term for a double-resolution iPad display since the resulting pixel density would be less than that of the iPhone 4 and iPhone 4S. Apple could, however, justify its use by arguing that the iPad is meant to be held farther away from the eye than its handset. Some reports have also claimed that Apple could choose to name its new tablet the iPad HD. AppleInsider reported that the third-generation iPad would have a Retina Display as early as last February. Apple had reportedly expressed interest in using the double-resolution display in the iPad 2 last year, but it was unable to secure sufficient production volume and low enough costs to implement it and decided to push it to the third generation. Apple will hold its much-anticipated media event at 10 a.m. Pacific, 1 a.m. Eastern on Wednesday. The company is widely expected to unveil an update to its Apple TV set-top box alongside a third-generation iPad. AppleInsider will have full, live coverage.